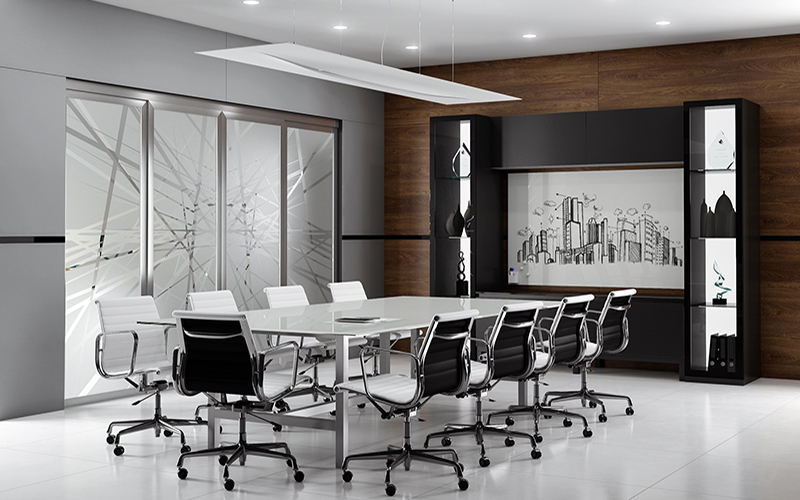 This modern conference room combines timeless materials with innovative design elements including the sliding door system featuring AF009 aluminum frame doors with custom etched glass inserts. Additional components that add to this sophisticated design include a backpainted glass conference room table top, aluminum frame base system in stainless steel finish profile BS001, magnetic markerboard, •eluma DecoPanel cabinet backers, and aluminum frame cabinet doors with elusion inserts. 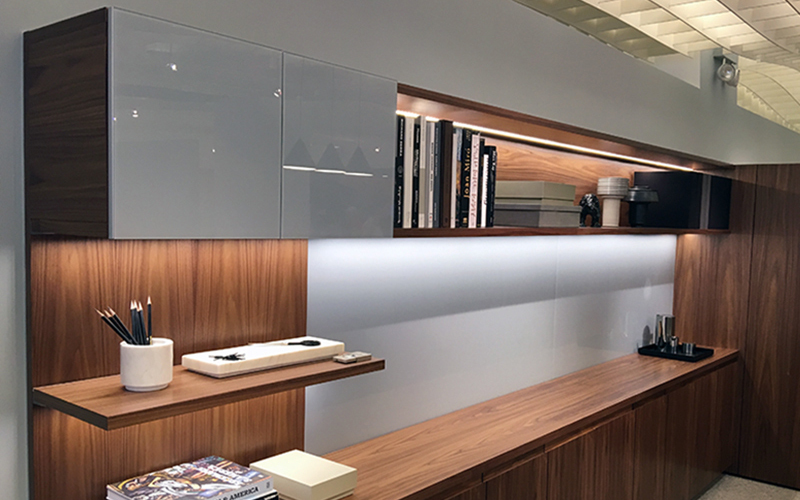 The durability of glass combines with the beautiful color to create a commercial workspace design that is truly unique.This innovative office design features our AF010 aluminum frame cabinet doors and magnetic marker boards with custom grey backpainted glass. Image courtesy of Geiger International. This contemporary office design and receiption space includes °eluma DecoPanel with RGB LEDs and morisco glass or custom digitally printed glass, natural aluminum finish base systems to create desk bases and coffee table, AF002 profile aluminum frame doors with white or low-iron satin glass in the credenza, large sliding door system featuring our AF009 frame and divider rails, and alpine white high gloss PARAPAN doors on the office wall unit. 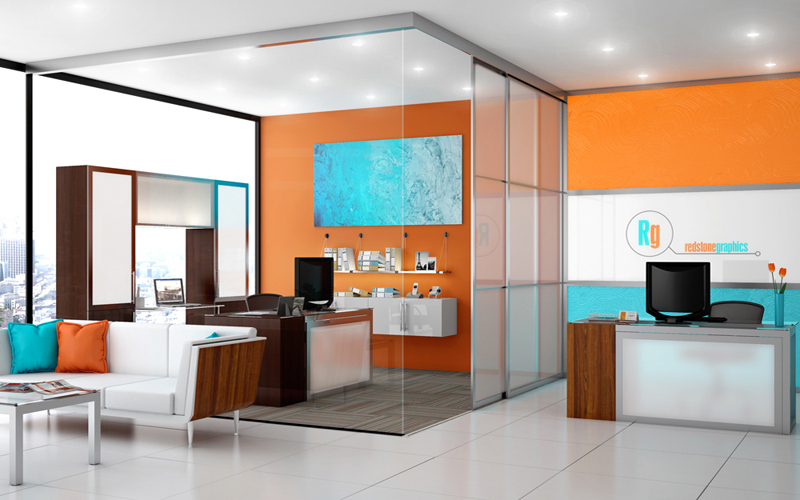 Custom etched glass adds interest to office designs by transforming standard glass into a custom design element. 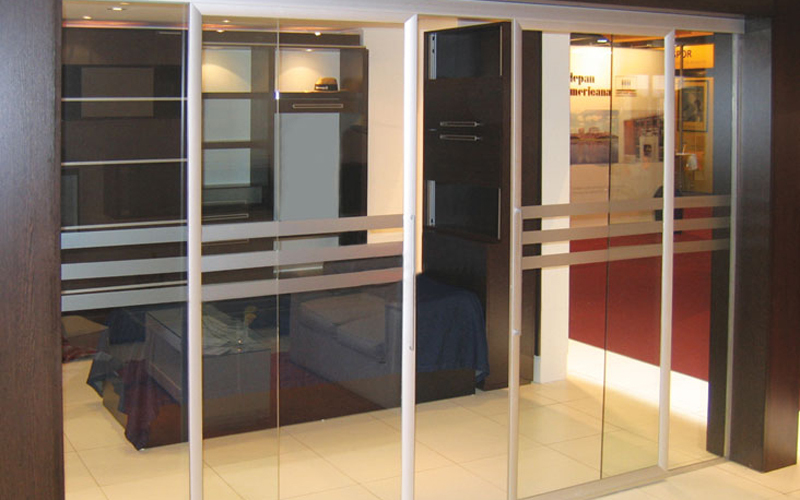 This sliding door system features our DN 80 sliding hardware, AF005 aluminum frames in brushed stainless frames and clear glass with custom etched lines. 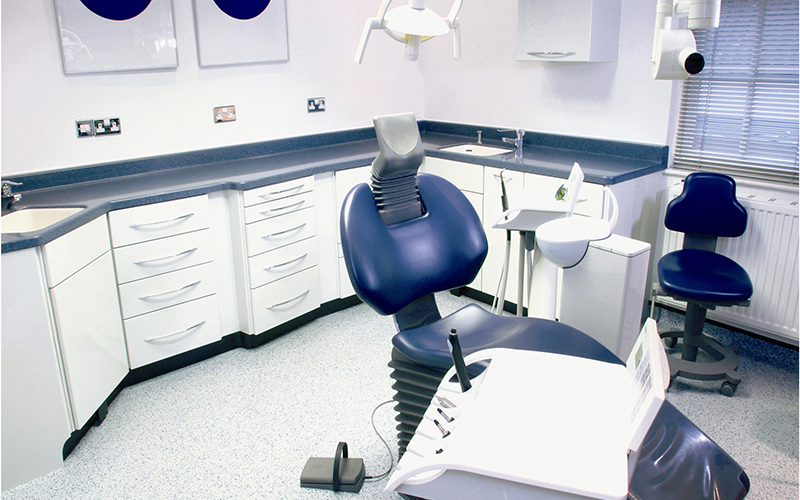 High-gloss PARAPAN® solid surface doors and drawer fronts are an ideal choice for medical and dental offices. These alpine white doors and drawer fronts are durable, waterproof, easy to clean, fully repairable and UV and fade resistant.